Many of our River Properties are located on the Chattahoochee River. The upper part of the river runs through the center of Helen, Georgia. 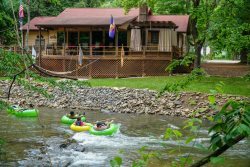 River activities in Helen include Tubing and Trout Fishing. We have a few properties on private lakes in the local area surrounding Helen. Guests will need to purchase a Ga. Fishing License & a trout stamp if they are fishing for mountain trout. Fishing licenses can be purchased online or at Betty's Country Store in Helen, GA. Absolutely Stunning River Home, Charming Rustic Decor, Not Many Cabins you can find right on the Hooch.